Remove the brake caliper from the vehicle. Refer to BR-43, "BRAKE CALIPER ASSEMBLY : Removal and Installation". Remove sliding pin boots from torque member. Remove sliding pin bolt bushing from sliding pin bolt. Place a wooden block in the cylinder body and blow air from union bolt hole to remove piston and piston boot. WARNING: Do not get fingers caught between pistons and brake caliper body. CAUTION: Do not reuse piston boot. Remove piston seal from brake caliper body using suitable tool. Do not damage cylinder inner wall. Do not reuse piston seal. Remove bleeder valve and cap. Check the inner wall of the brake caliper body for rust, wear, cracks or damage. Replace the brake caliper body if any abnormal condition is detected. CAUTION: Always clean with new brake fluid. Do not clean with mineral oil such as gasoline and light oil. Check the torque member for rust, wear, cracks or damage. Replace the torque member if any abnormal condition is detected. Check the surface of the piston for rust, wear, cracks or damage. Replace the piston if any abnormal condition is detected. CAUTION: Piston sliding surface is plated. Do not polish with sandpaper. Check the sliding pins and sliding pin bolt boots for rust, wear, cracks or damage. Replace the parts if any abnormal condition is detected. Install bleeder valve and cap. 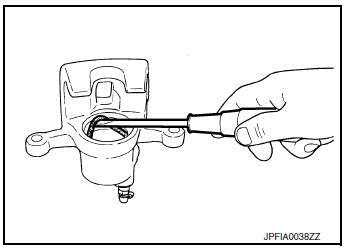 Apply rubber grease to piston seal (1), and install it to the brake caliper body. CAUTION: Do not reuse piston seal. Apply rubber grease to piston boot (1). Cover the piston (2) end with the piston boot, and then install cylinder side lip on the piston boot securely into the groove on brake caliper body. 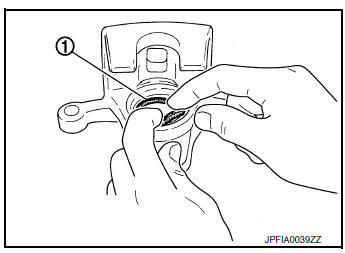 Apply brake fluid to piston (1). Push piston into brake caliper body by hand and push piston boot (2) piston side lip into the piston groove. CAUTION: Press the piston evenly and vary the pressing point to prevent cylinder inner wall from contact. Apply rubber grease to bushing; install bushing to sliding pin bolt. Install sliding pin boots to torque member. Install the brake caliper to the vehicle. Refer to BR-43, "BRAKE CALIPER ASSEMBLY : Removal and Installation". Check the drag of rear disc brake. If any drag is found, follow the procedure described below. Using a suitable tool, press the pistons into the brake caliper body. CAUTION: Do not damage the piston boots. Depress the brake pedal several times. Check the drag of rear disc brake again. If any drag is found, disassemble the brake caliper body. Burnish contact surfaces after refinishing or replacing disc rotors or if a soft pedal occurs at very low mileage. Refer to BR-19, "Brake Burnishing".